TIME says Obama is right: keeping tires properly inflated can save more oil than offshore drilling would produce. And it would do it immediately, rather than taking till 2030 to have any substantial effect. But who’s really out of touch? 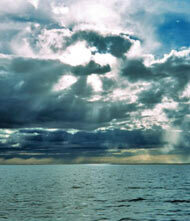 The Bush Administration estimates that expanded offshore drilling could increase oil production by 200,000 bbl. per day by 2030. We use about 20 million bbl. per day, so that would meet about 1% of our demand two decades from now. Meanwhile, efficiency experts say that keeping tires inflated can improve gas mileage 3%, and regular maintenance can add another 4%. Many drivers already follow their advice, but if everyone did, we could immediately reduce demand several percentage points. In other words: Obama is right. Look, things like drilling in the Arctic National Wildlife Refuge, and increasing offshore drilling, are bogus, band-aid solutions that sound good to the easily manipulated but aren’t going to make even a tiny dent in our long-term energy problems. Drilling in the ANWR might produce a six-month supply of oil, ten years after drilling starts â€” with no guarantee that it will have the slightest impact on oil prices â€” but the environmental destruction will last forever. It’s just not worth it. At this point, our petroleum-guzzling culture is like a junkie, wildly slapping around on our scarred, ruined arms trying to find just one more vein. We need to face facts and realize that finding one more vein isn’t the answer â€” the only realistic, long-term solution is to clean ourselves up and get off the junk. Up to now solar power has been a “Cinderella” energy source because storing the sun’s energy is so expensive and inefficient. Now scientists believe they have overcome the problem using technology inspired by photosynthesis in plants. The system allows small amounts of electricity from solar panels to split water into hydrogen and oxygen. A similar water-splitting reaction occurs during photosynthesis. Later, the gases can be recombined in a fuel cell to produce carbon-free electricity. 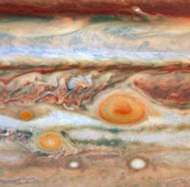 British expert Professor James Barber, from Imperial College London, said the technology represented a “giant leap” towards generating clean, carbon-free energy on a massive scale. More work needs to be done to integrate the new technology into existing solar power systems. But Prof Nocera believes that within 10 years people will be able to power their homes with a combination of solar panels and household fuel cells. 10 years from now would be a lot sooner than 2030, by the way. It’s absolutely within our scientific and industrial power to transition our culture to sane and sustainable energy sources. All we lack is the political will to stop listening to the junkie-enabling pundits and politicians who are sponsored by the oil pushers, who want to keep us hooked on a hopeless addiction as long as possible. Though there’s no expectation that Congress will repeal “don’t ask, don’t tell” and allow gays to serve openly in the military, the display had the effect of increasing bipartisan sympathy for the cause. Ah yes, esprit decor: that vitally important solidarity among interior decorators in the military. Because without esprit decor, how will the throw pillows get arranged properly in the barracks? But if he thinks having gays serving openly in the military is going to undermine esprit decor â€” rather than, say, taking it to dazzling new heights â€” the poor man is even more confused than he seems. Methinks some people in the t-shirt business misunderstand the basic idea of funniness. Well, um … no. That’s not especially funny. 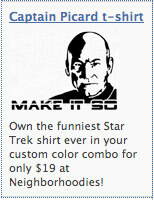 Sure, “Make it so” was Captain Picard’s catchphrase. But there’s nothing funny about just slapping that onto a T-shirt next to his picture. If you want a Captain Picard shirt that’s actually funny, what you do is you have him sitting in front of a sewing machine, frowning. If you really want to go for the gold, you could have Worf working on some needlepoint in the background, maybe. â€¢ First up, I just found this interview with Gore Vidal from May, in which he gives his current takes on Obama and McCain. In Vidalâ€™s opinion, â€œheâ€™s our best demagogue since Huey Long or Martin Luther Kingâ€. In his view, McCain is â€œa goddamned fool. He was on television talking about mortgages, and it was quite clear he does not know what a mortgage is. His head rattles as he walksâ€. Charlie Black, a top adviser to Republican John McCain, apologized yesterday for suggesting that another terrorist attack on US soil would help McCain’s prospects. He can apologize all he wants (or all the the McCain campaign wants him to), but it’s how the upper levels of the Republican party think. It’s how they’ve always thought. Remember, this is the party that used pictures of Bush on 9/11 as a fundraising premium. Turning tragedy into political and financial capital is their specialty. â€¢ Excellent profile in the NYT of Russell T. Davies, the man who regenerated Doctor Who, as he gets ready to step down from the show after next year and hand the reins over to Steven Moffat. â€œHe takes â€˜Doctor Whoâ€™ and pushes the envelope the whole time, not in terms of taste and decency but in terms of ideas and emotional intelligence, the size of feeling and epic stroke of narrative breadth,â€ said Jane Tranter, the BBCâ€™s head of fiction. She said that no one at the BBC had ever had a problem with Captain Jack or with any of Mr. Daviesâ€™s plotlines. â€œHow ridiculous would it be that you would travel through time and space and only ever find heterosexual men?â€ Ms. Tranter said. â€¢ And speaking of heterosexual men, who are everywhere (did you know? ), here’s a poignant Pride Month column by a straight guy and self-identified former “homophobic idiot” who was also a huge Monty Python fan, and who suddenly grew up the day he found out Graham Chapman was gay. I doubt this guy was ever really an idiot â€” just took him a while to overcome received prejudices, like most of us. But I appreciate his honesty and the point he makes here is well-taken. Every now and then I hear people arguing that it doesn’t matter whether gay celebrities come out or not, or that if they do it’s not news and no big deal (kinda like the whole gay Dumbledore flap). This piece is a perfect argument for why it does matter. 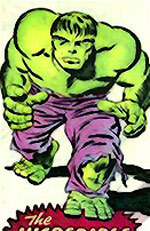 â€¢ Ever wonder why the Hulk TV series in the 70s changed Bruce Banner’s name to David Banner? As a little Marvel comics freak, that used to bug the heck out of me. Well, according to Lou Ferrigno, it’s because CBS thought the name Bruce was “too gayish.” Seriously. … and hey, what about those purple pants, anyway? I mean, how Tinky-Winky is that? â€¢ Chicago is cracking down on drivers who don’t give pedestrians right of way. About time. Power to the Pedestrians, that’s what I say. My old college pal Dan (well, actually we got to be friends after college, but that’s a long story), who was the master of the new-music mix tape back in the middle-eighties, turned up on Facebook recently and has been freshening up my iTunes with all sorts of fun new stuff. First up, “Pink Squares” by I Was a Cub Scout. It’s got a nice new-new-wave sound, but it’s also got a certain post-Death Cab for Cutie charm as well. I just love this to death. Next up, something I didn’t expect to like so much at first, but have gradually fallen in love with: “Fascination” by Alphabeat. This is just goofy pop fun, but it’s charming and lighthearted in a way that not much pop music manages to pull off successfully these days. In fact, I’m really enjoying the whole Alphabeat album. … And possibly my favorite new album Dan turned me on to is Keep Your Eyes Ahead by The Helio Sequence. And here’s some video of them on the latenight teevee. Watch the Republican pundits on Faux News shred McCain’s speech from Tuesday night. I daresay we won’t see him get within a mile of a green backdrop again. And suddenly, I can’t wait for the debates this fall with Obama and McCain on stage together. Compassionate Maverickism. Simple and to the point. The compassion part would serve notice that you have no actual interest in compassion and are just getting that part out of the way right off the bat, while the maverickism sounds appropriately rebellious and manly. Since you haven’t technically been a maverick in, what, a decade or two, this also would appeal nicely to the sullen longing-for-the-past that conservatism is so continually engaged in. McCain: Get The Hell Off My Lawn. People have been concerned about your age and health: the only way to combat this is to respond to it directly. With a slogan like this, people will know you are still vigorous enough to care whether or not people are on your lawn. Your concern about proper lawn care will resonate with the suburban middle class. And your invocation of hell will enliven the religious base, who are very eager to know that there is some class of people, somewhere, who you are willing to consign to hell for the most petty of reasons. … I like the second one best, but there are so many good options. Read them all here. 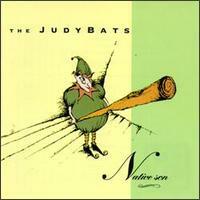 John C. Hughes has a post about The Judybats up on Popdose.com, part of the “Why You Should Like … ” series. He doesn’t have to convince me â€” the ‘bats were arguably my favorite band of the 90s and it broke my little heart when they busted up the first time. When their debut album Native Son came out in 1990, I snapped it right up because my sis had already told me all about them â€” she was going to school in Knoxville in the years when they were regularly playing the local clubs down there, before they got their major label deal, and she and her friends made a regular thing of seeing Judybats shows during that period. I bought all of their albums as they came out, and I think I fell a little more in love with them with each release. The first four Judybats albums have been out of print for ages, which is a crying shame â€” but I just this minute discovered that Native Son was reissued in February by Wounded Bird Records. Maybe the other three will follow eventually? Their second album, Down in the Shacks Where the Satellite Dishes Grow, is still my favorite Judybats record, so it would be especially nice to see that one available again. I’d take this excuse to write more about the ‘bats, but I’m on a tough deadline this week (and my freelance lifestyle knows no holiday weekends). So instead I’ll just direct you over to John’s post. And you might want to make a beeline while those Mavis Pickles the Third links are still fresh. 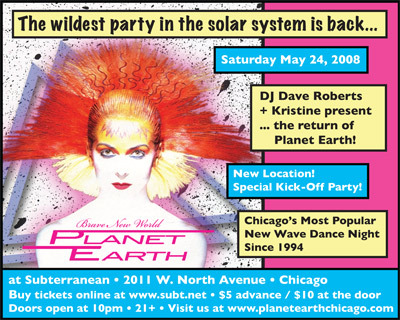 UPDATE: As he noted in the comments below, Will from Popdose has a follow-up piece up on the site now that looks at the terrific turn-of-the-millenium comeback album Judybats ’00, and then segues into an interview in which Jeff Heiskell himself serves up all kinds of hot dish.